Pemko automatic door bottoms consist of an aluminum case which surrounds a movable drop bar seal. 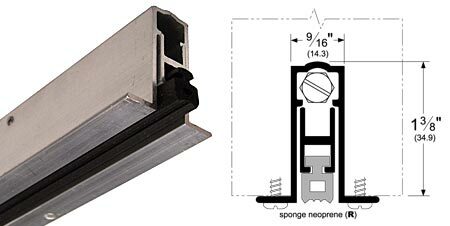 The drop bar seal is actuated by a plunger which contacts the jamb as the door is closing, forcing the drop bar seal down against the floor or threshold. The plunger requires low closing force to actuate the drop bar seal. Provide excellent seals to keep out draft, dust, moisture, insects, fumes, light and sound. May be cut down up to 2in. maximum. Width at bottom is 1-5/16".